Prior to returning your vehicle, a third-party vehicle pre-inspection is required. You may also conduct your own review with the help of our First Class Condition Card prior to the vehicle pre-inspection. You’re welcome to conduct your own review prior to the vehicle pre-inspection to familiarize yourself with the process and guidelines. The First Class Condition Card, sent to you in an information package, helps you to identify what is considered excess wear and tear. How does it work? 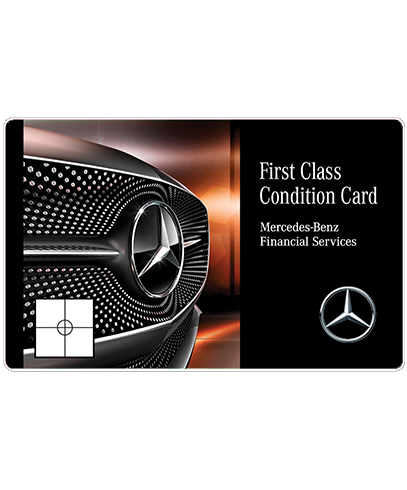 Place the First Class Condition Card over an exterior or interior blemish. Generally, if the damage (caused by a single event) cannot be seen with the card over it then a repair or replacement at your expense may not be required. * Please note, this may not apply to some interior blemishes and glass damages such as burn holes in the fabric and windshield chips or cracks. The approximate dimensions of the card are 8.5 cm/3.375 inches (width) x 5.5 cm/2.125 inches (height). As part of your assessment, check the number of kilometres you’ve driven during your lease period to verify whether you’ve gone over your predetermined limit. Please keep in mind that this self-assessment tool is for estimation purposes only and is not a replacement of the vehicle pre-inspection or of the determination in the Lease End Statement. Use the below obtain an in-depth understanding of how the Third-Party Vehicle Pre-Inspection is completed. The tires and rims match the original specifications (for Mercedes-Benz approved specifications, see sticker inside the driver’s door and Owner’s Manual). Please note, winter tires are not considered original equipment. Damage to the rims is only chargeable if it extends beyond the First Class Condition Card. Tire cuts, bulges, and sidewall damage are all chargeable regardless of the size. To ensure a seamless and easy return of your Mercedes-Benz, be sure to keep up with the necessary maintenance of your vehicle throughout your lease. It’s important that you get your vehicle serviced at a Mercedes-Benz Service Centre, where our state-of-the-art diagnostic systems can determine your precise service requirements. Please make sure that you have kept your service up to date and that all necessary maintenance has been completed before you return your vehicle. Scratches are not through the paint (regardless of the size). If your vehicle has scratches that do go through the paint, just apply the First Class Condition Card Test. If there is bumper scuff that doesn’t alter or expose the underlying material, it is acceptable regardless of size. If the underlying material is cut, shaved or torn, then apply the First Class Condition Card Test. All holes, tears or breaks are not acceptable regardless of the size. When assessing your vehicle’s exterior, keep in mind a maximum of 5 damage occurrences (that pass the First Class Condition Card Test) per panel is acceptable. These ‘panels’ include the vehicle’s front and rear bumper. This excludes holes, tears or breaks. Dents are only chargeable if they extend beyond the First Class Condition Card. Holes, tears, or breaks are chargeable regardless of the size. Bumper damage is only chargeable if it extends beyond the First Class Condition Card. All holes, tears, or breaks and structural damage are chargeable regardless of the size. Scratches through the paint are only chargeable if they extend beyond the First Class Condition Card. Interior scratches that do not penetrate the fabric are only chargeable if they extend beyond the First Class Condition Card. * A “star” is a chip with one or more legs. ** A “plug” refers to any repair to windshield damage. We recommend any windshield replacement be completed by an authorized Mercedes-Benz dealer to ensure the repair meets the manufacturer’s specifications. Keep in mind windshield replacement is often covered by insurance. Check with your insurance agent. Chips are only chargeable if they are more than 0.3 cm in diameter, and do not fit within the circle of the measurement tool on the First Class Condition Card. Anything changed or added to your vehicle is considered an aftermarket alteration and is not acceptable, unless it was installed by an authorized Mercedes-Benz dealer. Please note, not all mechanical, electrical, structural damage, odometer tampering or damage resulting from alterations to the vehicle can be immediately uncovered during the vehicle pre-inspection process. In case any of those damages are found after the vehicle is returned, an invoice will be issued accordingly. No charge with tow hook cover. Download the Vehicle Condition Review Checklist to help you review your vehicle’s condition and prepare for your vehicle pre-inspection. 1. What should I do if I’m not able to return my vehicle on the scheduled maturity date? We recommend contacting your Mercedes-Benz dealer to schedule your lease return. 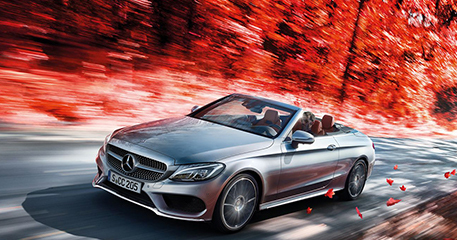 You can also contact Mercedes-Benz Financial Services at 1-866-202-6969 for any additional return options. 2. Why is it important to have a vehicle pre-inspection completed before returning my vehicle? The pre-inspection is an important part of the Lease Return Process, as it provides you with a vehicle condition review and identifies excess wear and tear prior to your expected return date. Not having a pre-inspection completed prior to returning your vehicle will put you at risk of unexpected charges appearing on your Lease End Statement. Once the pre-inspection is completed, we encourage you to contact your Mercedes-Benz dealer, who will review the pre-inspection results with you and provide information regarding the repair process and your return options. 3. Can repairs be performed by a dealership other than an authorized Mercedes-Benz dealership/body shop? We recommend repairs be performed by an authorized Mercedes-Benz dealer or body shop to avoid any potential charges for substandard or incomplete repairs. If you have any questions please contact Mercedes-Benz Financial Services at 1-866-202-6969 or contact your authorized Mercedes-Benz dealer. 4. What charges will my Lease End Statement include? Any excess wear and tear charges, excess kilometre charges (refer to your lease agreement), damage charges for anything that makes the vehicle unsafe or unlawful to operate, any remaining payments, and any additional fees you may have incurred prior to returning your vehicle. It will also detail any credits you may be owed. 5. Why might I not receive a Vehicle Condition Summary and a Lease End Statement at the time of return? If a third-party pre-inspection was not performed on your vehicle prior to return or if the condition of your vehicle has changed since the vehicle pre-inspection was conducted, a Vehicle Condition Summary and a Lease End Statement may not be available and a final third-party inspection may be needed to determine your final kilometrage and any excess wear and tear. 5. When will I get the refund of my security deposit? Once Mercedes-Benz Financial Services has been notified of the vehicle return by the dealership, your account will be settled. If there are no excess wear and tear charges, outstanding payments, excess kilometrage or additional fees assessed to the account, your security deposit will be refunded within 14 days. In the event that you move during the term of the lease please contact Mercedes-Benz Financial Services at 1-866-202-6969 to update your file. If you have any questions about vehicle condition guidelines, the vehicle return process or even specific wear and tear issues, please give us a call – we’re here to help you throughout your lease. Call the Mercedes-Benz Financial Services Lease Maturity Department at 1-866-202-6969 or your Mercedes-Benz dealer.